Channel Zero: Candle Cove TV series on Syfy. 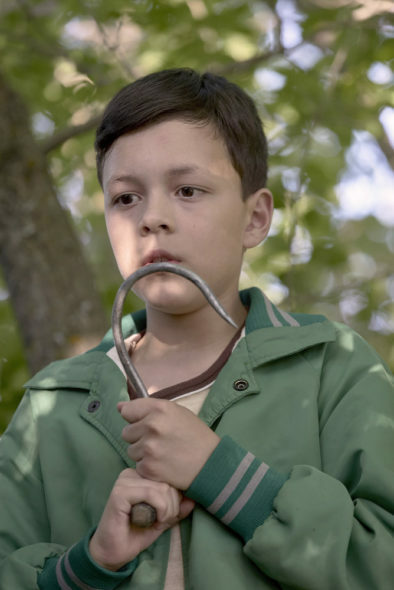 Pictured: Luca Villacis as Young Mike/Eddie (photo: Allen Fraser/Syfy). The first season of the anthology drama, “Candle Cove,” centers on “…one man’s obsessive recollections of a mysterious children’s television program from the 1980s.” The cast includes Paul Schneider, Fiona Shaw, Natalie Brown, Shaun Benson, and Luisa D’Oliveira. Channel Zero: Candle Cove premieres on Syfy. October 11, 2016 at 9:00pm ET/PT. A man returns to the hometown he left as a kid when his brother was one of five children murdered in a case that was never solved. Old memories return to the surface when one mother’s child goes missing after mentioning that she had been watching CANDLE COVE, a creepy children’s puppet show he used to watch on public access in the 80’s around the time of his brother’s murder. Although others remember watching this show, they are startled by the realization that it never truly existed and they had been staring at TV static. What do you think? How did you like the Channel Zero: Candle Cove TV series trailers? Do you plan to watch Syfy premiere? Let us know, below. Love the show! Luca Villacis and the rest of the cast do an awesome job at bringing this creepy pasta to life. Not gonna lie, I would normally be skeptical of not only a Syfy original series, but one based on a creepypasta at that, but this looks pretty good. I mean, I ain’t getting that excited, I’m a touch too cynical I think, but still.